Jingyi Chen, an assistant professor of chemistry and biochemistry in Fulbright College, accepts a check for $25,000 from Women’s Giving Circle president Martha Haguewood and Associate Vice Chancellor for Development Mark Power. FAYETTEVILLE, Ark. – The Women’s Giving Circle awarded $140,000 to nine University of Arkansas programs at its annual voting event on Friday, Oct. 24 – a record amount of funding since the circle’s inception 12 years ago. The recipients this year represent the most geographically diverse group of projects in the organization’s history. The circle also surpassed Chancellor G. David Gearhart’s 2013 challenge to increase its membership by rising to 127 members this fall. The Women’s Giving Circle is made up of U of A alumni, faculty, staff and friends of the university and was created to encourage women as philanthropic leaders. The circle raises funds in part by requiring annual cash gifts from its members. 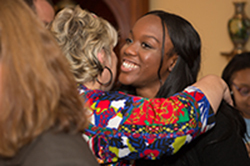 The annual gift requirement is $1,000 for alumnae or friends and $500 for recent graduates, students, faculty and staff. This year’s grant recipients were chosen from 51 proposals, with 11 finalists selected through an online vote. Women’s Giving Circle members heard presentations from the finalists as part of today’s voting event, and then chose the winning programs. The amounts of the nine grants given out this year ranged from $5,000 to $38,500. The Arkansas Teacher Corps Fellows, a collaborative partnership among the U of A, school districts and local community organizations that aims to provide high quality teachers in the areas of greatest need throughout Arkansas. The program received $38,500 and was represented by Benton Brown from the College of Education and Health Professions. Jingyi Chen, an assistant professor of chemistry and biochemistry in the J. William Fulbright College of Arts and Sciences, who conducts research on non-invasive treatments of breast cancer. 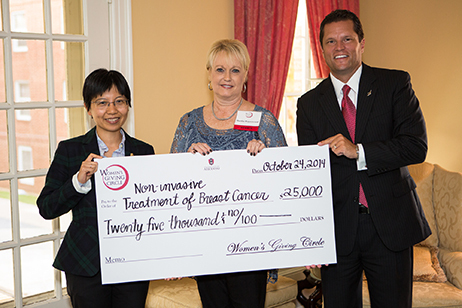 The $25,000 award will be used for the development of new technology for breast cancer treatment, with the possibility of transferring the technology to other cancer and disease treatments. Timothy J. Muldoon, an assistant professor of biomedical engineering in the College of Engineering, who received $22,000 for developing a point-of-care method for blood analysis using a simple microfluidics channel and a high-speed line-scanning system, with the ultimate goal of detecting cancer at an early stage and monitoring blood counts throughout treatment. The Dream B.I.G. Program’s educational sessions, which will expand the Dream B.I.G. Program and fund two impactful sessions during the Alternative Spring Break Camp in 2015. The program received $11,000 and was represented by Charity Walker and Holly Alker from the Center for Community Engagement. Ozarks at Large Preservation, Phase II, which includes digitizing and archiving the locally produced, one-hour daily news magazine, Ozarks at Large. The program received $10,000 to preserve the local NPR affiliate’s history of programming and was represented by Kyle Kellams and Leigh Wood of KUAF. Cynthia Sides and her program to promote STEM education and career opportunities in South Arkansas. Sides plans to use the $10,000 to collaborate with Georgia Pacific Corporation in Crossett to create a mechanism by which female students enrolled in third grade through graduate school are attracted to the variety of STEM careers available in their area. Female U of A STEM students will be utilized to mentor the next generation of scientists and engineers. Madres Sin Límites, a bilingual literacy program designed by the Office of Latino Academic Advancement and Community Relations to help Latino mothers and their children improve their reading abilities in Spanish and English. Mirna Ordoñez Sandoval and Jeanette Arnhart represented the program and will use the $10,000 grant to actively involve parents in their children’s educational process, increase participants’ knowledge, develop appreciation for education and cultures and reduce the educational gap for Latino students. Tameka Bailey, a visiting assistant professor of biological sciences in Fulbright College, and her project, Root of S.T.E.M. : Recruitment of African-American Women. A grant of $8,500 will be used to improve academic performance in biology and other related sciences by African American junior high females from Gould, Arkansas. Arkansas Reads Program: Promoting Women in STEM, which was represented by Suzanne McCray. The $5,000 grant will be used to implement literacy programming to encourage elementary-aged girls in the Arkansas Delta to pursue education and careers in the fields of science, technology, engineering and mathematics. Because the Women’s Giving Circle met the challenge made by Gearhart in 2013, the circle received an additional $50,000 donation toward its total giving pool. The total giving from the circle now stands at nearly $900,000 since its inception. Mark Power, associate vice chancellor for university development, and Martha Haguewood, incoming president for the Women’s Giving Circle, presented checks to the grant recipients. The Women’s Giving Circle was established by founding members of the Women and Philanthropy Committee of the Campaign for the Twenty-First Century and included Pat Cooper, Mary Trimble Maier (B.A. 1949), Julia Peck Mobley (B.S.E. 1965), Harriett Phillips (B.A. 1972), Debbie Walker, Lynne Walton (B.A. 1970), Mary Lib White and Donna Axum Whitworth (B.A. 1966, M.A. 1969).